Used as a self-defense tool, looks like a small bunched fist. 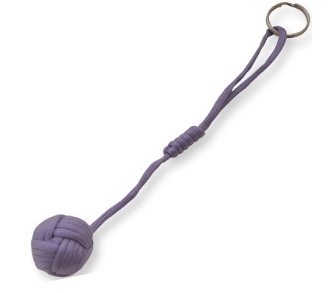 Tied at the end of the string, inside the knot, is a metal ball making it easy to throw. These things can crack glass, metal, skulls or whatever you can throw it at. The paracord is designed to be extended or shortened for your own desired length, so each Monkey Fist is customizable. And it also doubles as a survival rope in case you find yourself in need of strong and durable string.